Please check out this new project by my friend Steve over at everythingesteban blog. Show us a photo that represents to you God’s presence in the natural world. My husband and I have settled into middle age and the empty nest by picking up a new hobby: gardening. I recently posted on Facebook that it’s a wonder I managed to raise three kids when I killed every houseplant I ever came into contact with, so this gardening thing is, well, comical. And yet, we have great success. We’ve managed to grow fruits and vegetables in spite of ourselves, and we’re delighting in the beauty of flowers whose names I’ve only just recently learned. The garden attracks butterflies and birds, and little creatures who help themselves too much to my berries. We enjoy sitting in the backyard in the early evening waiting for the sun to go down, lulled into a quiet repose. Our silence is broken only by the occasional suggestion to look at a bird feeding, and we quickly return to our quiet state. I should point out that we’re the ones who are quiet; the backyard is full of life and all the noises and sounds that come with that — but it’s through our interior silence that we’re able to take in all the activity around us. The different kinds of birdcalls, for instance. One of these days I hope to differentiate between the cardinals and the bluejays. I can identify my enemy, the mockingbird, and I’ve even seen some bluebirds venturing into the trees, too. My husband has worked hard at making this little getaway for us and filling it with a variety of things to both entertain us and beautify the area, but it is the Master Gardener who ultimately put the finishing touches on this, His masterpiece. His loving touch embraced me suddenly and unexpectedly — aren’t His gifts always an amazing surprise? Last evening, in the dwindling light, a soft breeze came up, carrying with it the scent of honesuckles. It filled the patio with the sweet scent, and it carried me back a million years (or maybe forty) to my childhood. Funny how something like a scent or a sound can do that. I followed my nose to the source, a wild and messy blanket of honeysuckles covering a little corner of the yard that I’ve remarked is unsightly and in need of attention. God, it would seem, had me covered. ← Happy Mother’s Day Mami! 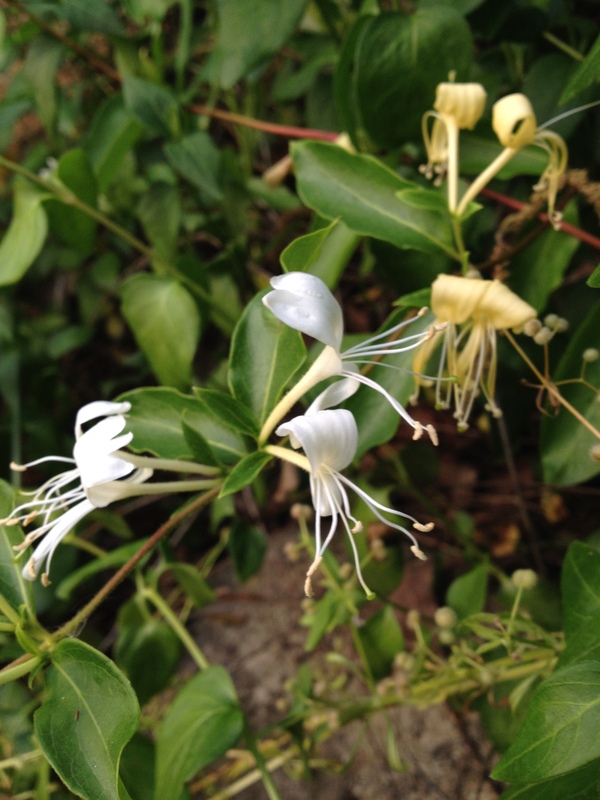 Ok, I just looked for this post, Maria, because I was thinking of posting a picture of the honeysuckle I came across this morning in my bushes. I took a piece of it to work and gave it to my co-worker who was in need of cheering up. Now I have to find something else to photograph. Hmmm. Why something else? if the honeysuckle you found is beautiful, post it!!!!!! !